I read a lot of American food blogs, so I’m constantly filing things away in my head to try next winter (or summer) when they become more seasonally appropriate. There are times when the northern and southern hemisphere food connect a little but, as we move into the festive food seasons of Thanksgiving and Christmas, the worlds move further apart. As Australians don’t really have a big, festive celebration in during our winter, a lot of the American and British festive food just doesn’t really work that well here. All my favorite American food blogs having been posting Thanksgiving side dishes for weeks now, including lots of recipes for a kind of revamped green bean casserole, which is a traditional Thanksgiving side of green beans baked in a kind of mushroom soup sauce and topped with crispy fried onions. Because I have no nostalgic connection to the original dish, all I can think of while reading a recipe for green beans baked in mushroom sauce is Why would you do that some perfectly nice green beans? Not that I’m judging – Australians have our own food oddities that are difficult to explain, like Vegemite – a black, sticky, yeast extract which we spread on toast and is a bit of cure all for all kinds of ailments – hangovers and a general pick-me-up feel-good kind of food that we love with a kind of an unreasonable passion. Speaking of salty-things-to-spread-on-toast kind of gives me a segue into whipped feta, which is also a nice salty thing to spread on toast (but probably more universally appealing than Vegemite). The good thing about Australian Christmas food is that it works best with the casual summer vibe, and what could be better or easier than whipped feta. Last summer, I made the Greek feta and red pepper dip, tyrokafteri, quite a bit and it is delicious – but I think I prefer the billowy whiteness and versatility of just the plain whipped feta. 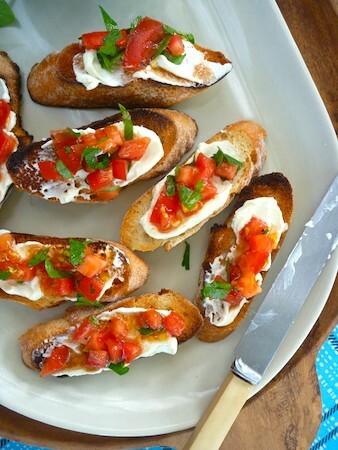 You can serve it with tortilla chips and fresh salsa, on crostini topped with chopped tomato and herbs or roasted peppers as an accompaniment to refried beans, or on toast for brekkie with just about anything. There is also something kind of entrancing about the name ‘whipped feta’. I don’t whether this is because it conjures up a ‘Madame Lash’-type character, whipping some feta or because I couldn’t get the Devo song Whip It out of my head when I was making it, but there’s something about the name that sticks in your brain. Here it is, have some whipped feta – Whip it good! Perfect for Christmas drinks, picnics, parties, brekkie and brunch, anytime, anywhere. Place roughly chopped feta in a food processor and process until combined. Add lemon juice and olive oil and process, until light, creamy and whipped! Season with salt and pepper to taste and mix until combined. I served this spread over some toasted bread ,rubbed with garlic and a topping of chopped tomatoes and herbs dressed with olive oil and balsamic vinegar. I don’t eat feta but Steve does, consider this recipe pinched and about to be perambulated about like it’s mine! 😉 I will give you credit but only if he likes it…fair deal? Fair enough, it’s barely a recipe more like an idea to whip up on a whim. This looks very delicious! I agree – the thanksgiving recipes are all wonderful to look at but completely impractical for us in the Southern Hemisphere! It’s taken a long time but Australian Christmas food does seem to have finally escaped from our past of colonial British Christmas fare. What a great idea! I love this. Looks so light and fluffy and I agree, ‘whipped feta’ just rolls off the tongue, immediately bringing to mind that wacky Devo tune :). 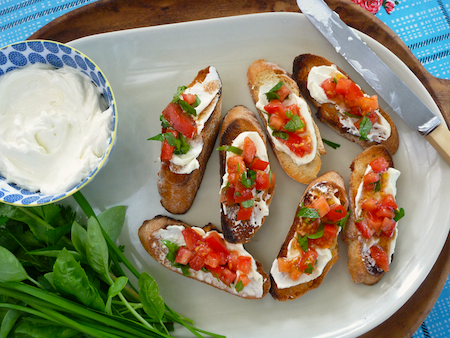 And the colours of your gorgeous bruschetta toasts are so brilliantly christmasy – how about that! Yummo! I love feta so this looks like the perfect side dish, or quick snack. Delicious! It is really good I made some corn cakes the other night and had them with this feta and a fresh salsa and it was so goood! 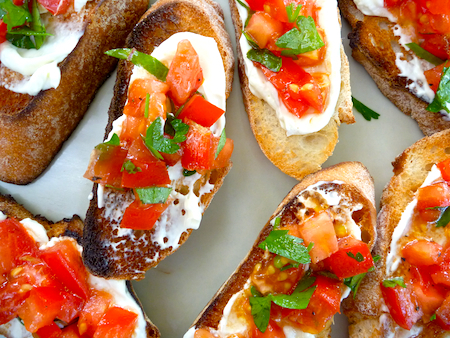 What a great looking feta spread – love how soft and smooth it is! Australians are used to living at the bottom of the world, getting up at 2 o’clock in the morning to watch the world cup and Olympic finals, we’ve grown up adjusting to the Northern hemisphere dominance so I don’t really think about it that much. But we do miss out on a really good winter food festival attempts have been made to manufacture them (Christmas in July) but this coming year I think I’m going to invent my own festival and celebrate with winter festive food.